Moms can be ready with the Symphony® Double Breastpump Kit which allows them to double or single pump at any time. 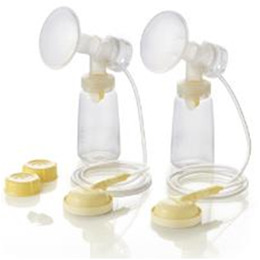 This Symphony Double Breastpump Kit includes everything you need to start pumping including tubes, bottles, membranes, breastshields and valves. The breastpump is not included. For single or double pumping - Can be used for single pumping as well. Unit Size/Packaging 6 3/4 in. x 5 in. x 8 1/8 in.